In the 1980s, changes in upstream land uses, such as agriculture, critically lowered the amount of fresh water supplied to the bay. Less fresh water led to increased concentrations of salt and decreased water circulation. The interaction of these factors led to a mass die-off of seagrass, affecting 30% of the entire seagrass community, lowering oxygen in the water, and resulting in a nonlinear shift between clear water and turbid water in some areas.2 The sources and symptoms of the die-off also led to the loss of key grazers, such as sea turtles, further exacerbating food chain impacts. The South Florida Water Management District (SFWMD) launched the first restoration and monitoring efforts in 1992. However, competing scientific hypotheses3 for the mechanisms of seagrass die-off hindered the SFWMD’s ability to control a single driver that would prevent further ecosystem change.1 After years of experimenting with various potential drivers, the SFWMD created the Minimum Flows and Levels program to maintain freshwater delivery and restore the seagrass ecosystems of the bay.4 If a minimum threshold of freshwater input is breached, upstream municipal and agricultural water uses are prohibited until water delivery is restored. 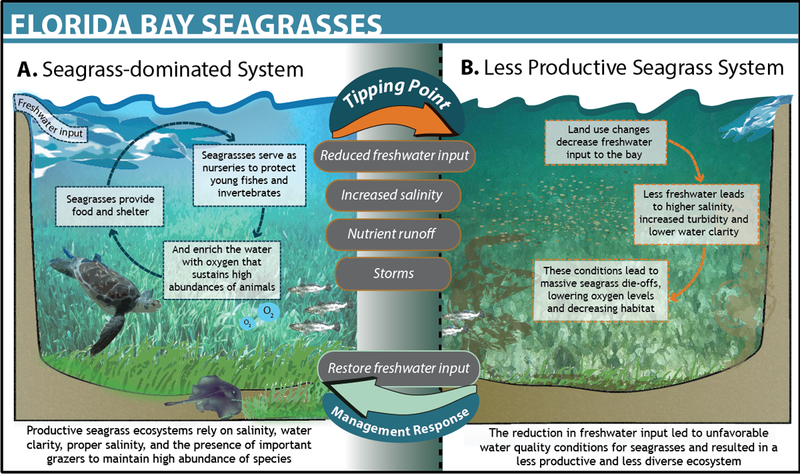 There have been no seagrass die-offs since the implementation of this program. Florida Bay was one of the 51 case studies of management in threshold-based ecosystems we quantitatively reviewed.5 Our findings suggest that threshold management works, routine monitoring is key, and geographic scale matters. In Florida Bay, the threshold of concern (freshwater input into the bay) is explicitly incorporated into management targets based on the best available science,6 monitoring occurs on a weekly basis to ensure the ecosystem variable is tracked on a time scale relevant to potential impacts if the threshold is crossed, and the spatial scale of upstream inputs is small enough for the SFWMD to manage and control their delivery. Florida Bay illustrates how managers can employ threshold-based targets and routine monitoring, among other tools, to mitigate rapid ecosystem degradation. 1Rudnick, D.T., Ortner, P.B., Browder, J.A., S.M Davis. 2005. Florida Bay conceptual ecological model. Wetlands 25 (4), 870–883. 2Madden, C., Rudnick, D., McDonald, A., Cunniff, K., and J. Fourqurean. 2009. Ecological indicators for assessing and communicating seagrass status and trends in Florida Bay. Ecological Indicators 9S:S68-S82. 3Gunderson, L. H. 2001 South Florida: the reality of change and the prospects for sustainability: managing surprising ecosystems in Southern Florida. Ecological Economics 37, 371–378. 5Kelly, R.P., A.L. Erickson, L. Mease, W. Battista, J.N. Kittinger, and R. Fujita (2014). Embracing thresholds for better environmental management. Philosophical Transactions of the Royal Society Biological Sciences 370, 1659.